Because the ecology of various regions differs, it is silly to club them all under one countrywide average number, says Nitin Sethi. A whopping three-fourth of the country’s geographic area is right now facing a rainfall deficit severe enough to warrant crisis management. The Indian Meteorological Department’s data shows that 74 per cent of India has so far recorded monsoon rainfall much below its normal levels. Of the 36 rainfall divisions that the IMD divides the country in, 25 are reeling from rains much below what is considered normal for the region. As of yesterday 22 of the 25 have recorded rainfall dipping by more than 40 per cent below the normal for the specific belts. Even by the lax Indian government definition, less than 20 per cent rain means a meteorological drought (earlier it used to be triggered on official records by a 10 per cent dip in rainfall). 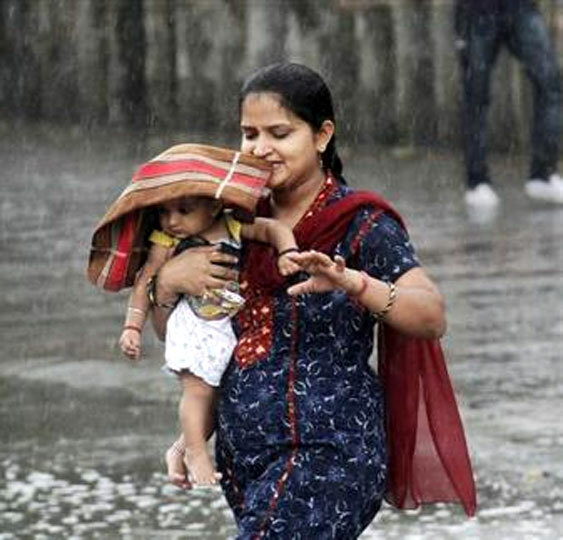 Image: A woman carries her child through a heavy rain shower in Chandigarh. Yet the IMD figure of 31 per cent country-wide area-weighted average figure for the entire monsoon season or a 15-16 per cent deficiency in the last week’s rainfall country-wide area-weighted data is being deployed to suggest that the monsoon is not all that bad and its only getting better when one compares to the previous week. Let’s not get fooled by the averages. 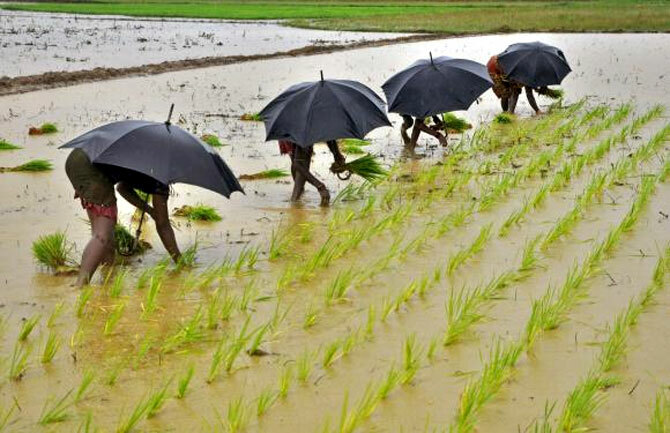 Farmers who depend upon monsoon to water their fields do not live by averages, they have to survive the extremes and the variation in the rains through the season. For a farmer, how the rain is spread over the monsoon period is critical. A dry sowing period followed by a huge downpour at a later stage of plant growth can be cataclysmic. For an analyst keeping sight of only the average rainfall it will only show a near ‘normal’ rosy picture of rain catching up finally. 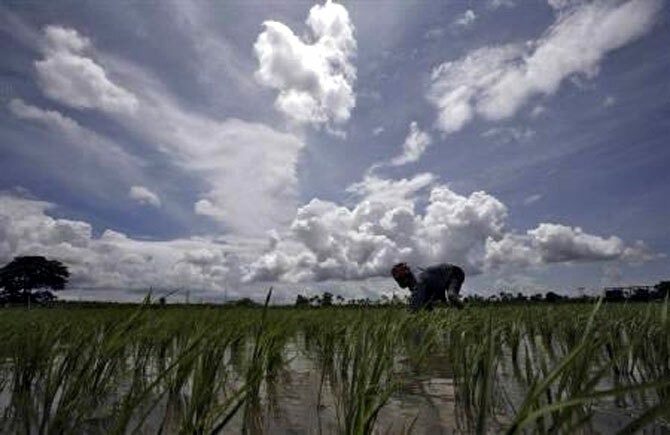 Image: A farmer works in his paddy field against the backdrop of monsoon clouds in Agartala. The pattern of rain that is most advantageous also differs from crop to crop, in fact, also from seed variety to seed variety. The availability of hardy short-duration varieties that shall survive low rainfall levels but give relatively lower productivity are a safer bet for a farmer in a bad monsoon. The farmer has a short time-gap and the increasing unpredictability of rainfall patterns to make these calls. This is where the government and the IMD reports are meant to come in handy. To have the right seed available and to have it in time is critical. To keep the fields ready to start sowing operations. Image: Labourers plant saplings in a paddy field on the outskirts of Bhubaneswar. To understand the complexity of decision-making a farmer faces, one has to only read the regional Agromet advisories that the government puts out periodically. For any average city-dweller in India who only has to deal with the question of whether the city roads will be clogged with overflowing sewage or not, it can send the head spinning. 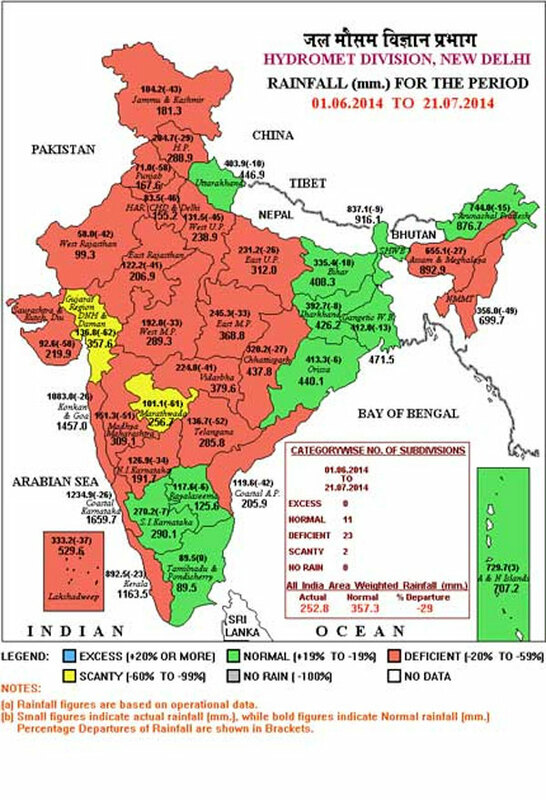 It is true, the monsoon is catching up in parts, the IMD raw-data shows. But, for a real picture of where it is and where it is not going to be enough, one only needs to survey the regional papers that reflect a more district-level variation of the hinterland. 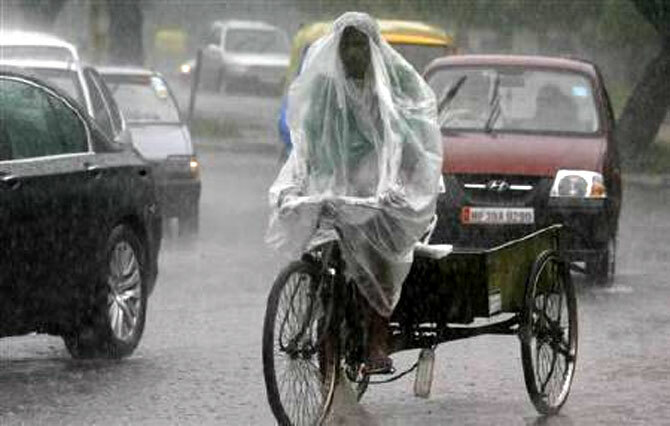 Image: A man uses a plastic sheet to guard against a downpour while riding his trishaw in Chandigarh. To reassert the point on getting lost in averages: normal monsoon in the evergreen ecological belts of Manipur, Mizoram, is 686.6 .4 mm for the season. For the drylands of Saurashtra, it is merely 213.1 mm for the same period. The ecology of the regions differs. Therefore, what the people grow and how they grow differs. It is silly, by any logic, mathematical interpretation or ecological sense, to club them all under one countrywide average number when reviewing how they shall fare through a year of climate and weather patterns. 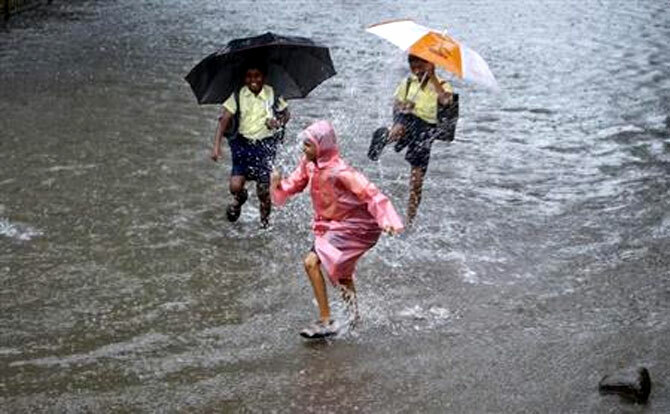 Image: School children play on a flooded street during heavy monsoon rains in Mumbai.